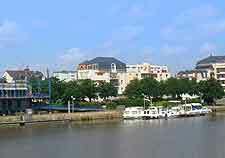 Le Mans is a truly unique city and for many is little more than the location of the world-famous 24-hour La Mans car race, which was first held in 1923. This true test of endurance is held each year in June around the Circuit de la Sarthe, a track mainly made up of closed public roads around Le Mans. This event is clearly the pinnacle of motor sports in France and not only attracts notable drivers and major names from the car industry, but also literally many thousands of excited spectators. For others, there is far more to Le Mans than just its legendary motor sports past. The Old Town area of Le Mans is especially appealing and features ancient Roman walls, a true labyrinth of winding alleyways, and many old buildings, which are full of character, both inside and out. Close to this part of the city you will find the Sarthe River and the centrally located Place de la République. Just a short walk from the imposing Place de la République and its many shops and eateries, the nearby tourist information centre lies along the Rue de l'Etoile. The office dispenses a range of tourism advice and bags of current race information about not only the 24-hour race, but events taking places on the smaller Bugatti Circuit, including Grand Prix motorcycle racing and various touring car championships. Le Mans surprises many tourists with its rich Roman heritage and historic attractions, which contrast with its popular theme parks. Much of Le Mans is dominated by its awe-inspiring cathedral, the Cathédrale St. Julien, while on the outskirts of the city, the Cistercian Abbey of l'Epau (Abbaye de l'Epau) is also rather impressive. More family orientated are the city's Papea City wild-west amusement park and its fast rides, and the swimming pools and slides at the Centre Aquatique 'Les Atlantides'. More information about Le Mans Tourist Attractions. Le Mans is famous around France and the world for its motor racing and a number of its main landmarks are related to this industry, such as the city's two racing circuits. The Circuit de la Sarthe is especially popular when the '24 Heures du Mans' car race takes place and attracts crowds of thousands, while the more permanent Bugatti Circuit hosts many important racing events every year. 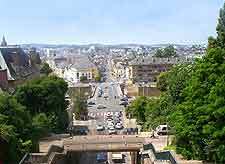 Historic landmarks are also located around the Le Mans area and provide plenty of tourist appeal, such as the ancient Gallo Roman Walls, and the Roman Baths, which are known locally as the Crypte Archéologique des Thermes Romains. More information about Le Mans Landmarks. 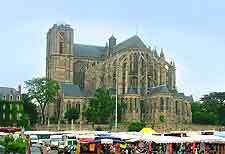 Le Mans offers many historical connections and cultural attractions, some of which date back to Roman times. 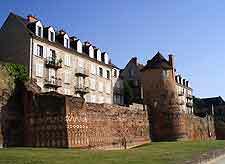 Within Le Mans, the main museums and galleries include the Musée Vert and its many natural history displays, the huge collection of vehicles at the Musée Automobile de la Sarthe, the aquariums and water treatments at the Maison de l'Eau, the paintings and Egyptian artefacts at the Musée de Tessé, and the many art works at the Musée de la Reine Bérengère. More information about Le Mans Museums and Le Mans Art Galleries. Lying on the northern side of the Loire Valley, Le Mans is surrounded by many appealing small towns, which have much to offer tourists. Good day trips from Le Mans include excursions to Angers, Château du Loir, La Flèche, Saumur and Tours, all of which have something special to offer, ranging from museums and historic chateaux, to beautiful countryside, woodland trails and public parks. 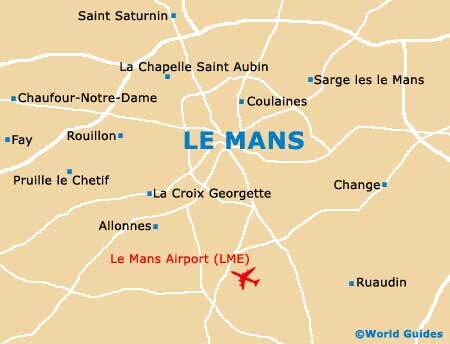 More information about Le Mans Attractions Nearby.